It’s that time. Seasons are changing from cool to cooler. Many people find the onset of winter as a bad thing. Fishermen, however, do not. Ice fishing is a great sport and is really its own sport–separate of it’s summer counterpart. Because ice fishing is much-anticipated we are very excited and can’t wait to get on the lake. First ice is, after all, the best walleye fishing of the season. Be careful. Assess the ice, and enter it for the first time with great caution. Wear a life vest, bring a length of rope, and some ice grippers, an ice chisel to test ice, and most importantly let some one know where you are. Chip a hole in the lake every 50 feet or so the check for ice quality and thickness. Walk slowly and carefully and look for ice thinner then 4 inches. If you chip a hole in the lake that appears to be less then 4 inches. Walk back to shore on the same path you walked out on and get in your vehicle and drive home. The first 7-8 inches of ice grows about 1 inch a day if the overnight temps are below zero degrees. Once the ice reaches 8 inches it slows it’s growth a little bit (under similar conditions), as 8 inches acts as it’s own insulator. If it’s very cold (minus ten to minus twenty) the ice will grow 1 1/2 inches a day for the first week–but those perfect ice making conditions are rare. Keep in mind too, that not all lakes freeze the same way, so treat each lake like a new event, and excersize caution accordingly. Also, note that lakes change how they freeze from year to year. One year they freeze shut in a single day while other years it may take two to three weeks for a lake to freeze completely. Spring action and snow cover are the enemy and will delay safe-ice and growth by nearly a month in some cases. Laziness seems to be the biggest hurdle in ice checking. Most folks just don’t do it because it takes time and energy. Throwing a rock at the lakes edge isn’t good enough. Get safe. Explore the first-ice cautiously. When you’re out on the lake for the first time and you’re standing on the ice, alone, take note of the solitude of the moment. It’s fabulous. Standing on first-ice is a miracle. Just be careful not to ruin the miracle by being lazy and in a hurry. One final note of caution. Be your own researcher. Don’t rely on other’s ice reports to make it safe. And in the same stroke, don’t let someone else’s careless mistake keep you from the ice–it’s a great sport but you need excersize caution on first-ice. Summer fishing was strong this season. I spent all but 3 days on the lake in a 5 1/2 month period. It was intense. I had really hoped to get more blogs out this summer but I was shot by days end. I had my last guide outing November 11, and it was cold. 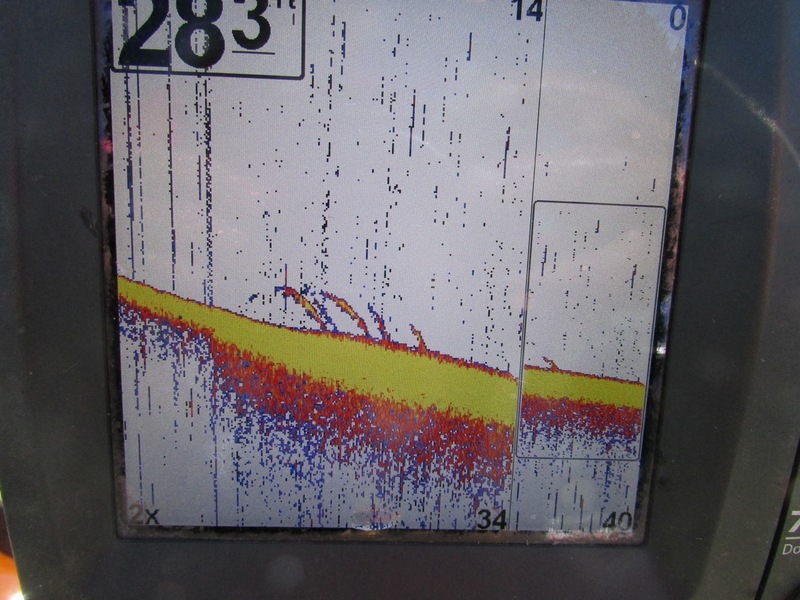 The fish had slipped into their late-season early-ice pattern. The deeper walleye were still mid-day feeding but the nicer weed-line fish were wanting to wait till low light to get going. The last few weeks of October were very strong–great sized walleye and steady action, but the weather was tough. My guests endured amazingly frigid conditions–lots of wind, sleet, snow, and more wind. Everybody met me at the landing and we returned to the landing with good catches. Now, winter is on it’s way and along with it comes the ice fishing season. I’m preparing my fish houses right now and am anxious to get back on the lake and start drilling holes and getting my houses on good fishing. I’ll be very active with my blog again in the next several weeks and will be giving ice reports and fishing forecasts–so stay tuned. In the same stroke I’m going to continue to show images from my Humminbirds.